My Fall Garden? I guess most of it looks like my Summer Garden, only inside the hoop house (where it was a balmy 85 F today, contrasting with the 56 F outside). 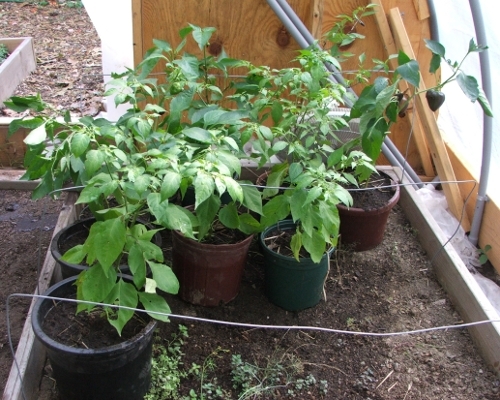 Yesterday I moved most of the (sweet and hot) pepper plants from the outside beds into pots and then into the hoop house. When that gets moves onto the Winter Garden beds, I will move all the potted plants to the Annex (the guest suite, which we heat minimally in Winter) and overwinter them. I was really happy to have overwintered those two pepper plants last time. They were my best producers, giving me two rounds of fully red peppers, and I just harvested another round of green peppers. 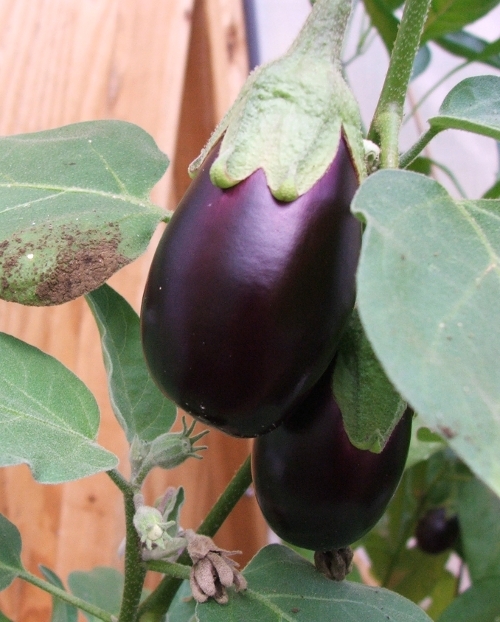 Peppers are, after all, perennials, so why not bring them inside, if you have the space and the inclination to water them once and a while? 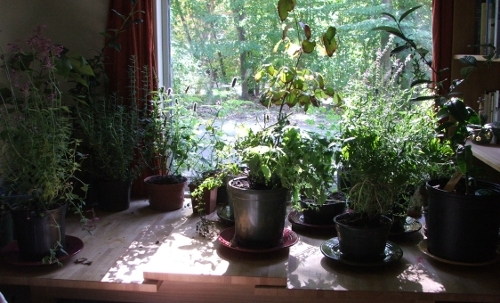 I’m also overwintering most of my culinary herbs. They are inside already, the prettiest ones in the living room, the rest in the Annex, which has a large south facing window. I’ll be happy not to have to devote so much space to oregano, thyme and rosemary seedlings when I turn on the lights in February. 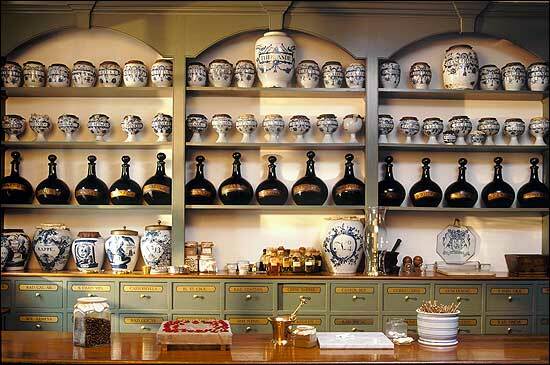 There will be more room for medicinal herbs and flowers. I harvested 3.5 lbs of green tomatoes (both large and cherries) and pulled the vines, as well as the one cucumber vine, on which I discovered 4 cukes, one of them an overlooked one weighing in at 1.2 lbs. So most of my beds are empty. The only things that I sowed in Summer, outside the hoop house, and that are left to harvest are the carrots, leeks, and celeriac, all of which improve in taste with a light frost, and kale. The Winter beds – awaiting the hoop house but covered with just row cover at the moment – hold spinach, kale and broccoli. Tomorrow I might have the chance to also transplant the Minutina, Claytonia (Miner’s Lettuce), Tatsoi and Pac Choi. I am reserving the lettuce and some more spinach seedlings for the hotbed under the cold frame, but more about that soon. Your hoop house is absolutely inspirational. I had one on my 2010 goals list, but at the moment we’re in a race against time to get the other field fenced. And as you know, projects always take longer than we hope! 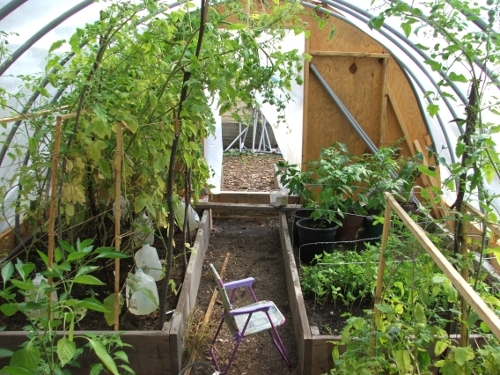 I’ll just have to put the hoop house at the top of 2011’s list.